Home > Our Culture > Systematix Eye Check-up Campaign: A Building Block to The Vision of Eye Care for The Team! You are important to us, and thus we love to care for you! 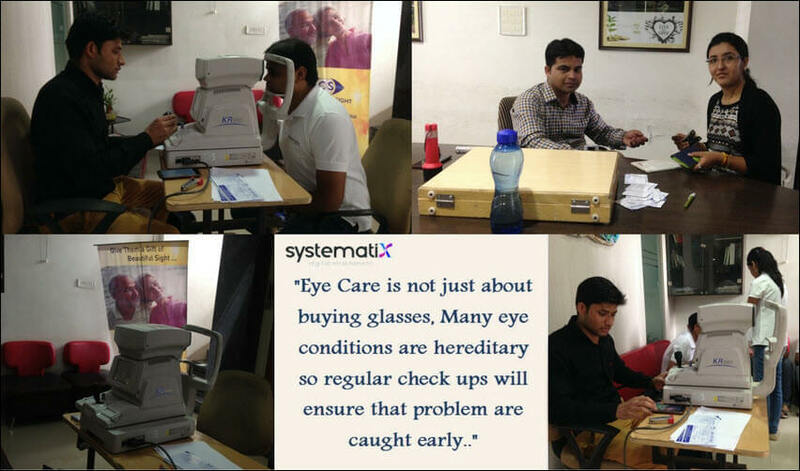 With this long-term goal, Systematix conducted an eye check-up campaign on 23rd Sep’16, Friday in office premises. We realize that eye care is not just about buying glasses, but there prevail many eye conditions that are hereditary and thus require regular check-ups so that they are detected at an early stage!! Not only it was an immense pleasure in taking a step closer for caring for our family members, but it also was our responsibility towards our family members. Systematix is well aware of the fact that the members of the company work all day long, with their eyes glued to the computer screens! This not just affects their mental health, but also strains their eyes. And eyes, being one of the most important parts of our body, have to be taken care of. So, as a family, Systematix decided to take the charge for this campaign and made sure that each of the members of the company had his/her eyes checked! During the check-up, the eyes were checked for common eye diseases, assessed how the eyes work together as a team and were evaluated as eyes are also an indicator of the overall health. Get a comprehensive eye exam. Having a routine comprehensive eye exam is the most important thing you can do to prevent or treat computer vision problems. They also answered every query that was raised during the campaign and made sure that all the team members were well aware of everything that should be known for the care of the vision! The Systematix team, on the other hand, participated very enthusiastically and got all their doubts cleared regarding the care of their eyesight! Systematix shall now be regularly conducting such campaigns so that it fulfills the values of the company! These were some of the highlights of the eye-care campaign conducted recently! !